Within this long article, I not only provide examples of my own direct experiences with the use of both San Pedro and Ayahuasca plant medicine, but I also point out the benefits of using this healing and consciousness development based method. There are many choices we can make, out there in the world, to find the answers that we each seek, and to work on the psychological issues and physical illnesses that we may have. As a healer and consciousness development focused teacher, I have had the opportunity to experience many different forms of healing. I highly recommend plant medicine, such as San Pedro and/or Ayahuasca, as an option for you to investigate, and consider. The San Pedro columnar cactus — native to the Andes Mountains in South America — has an interesting history. It is known to have been used in Andean traditional medicine for over three thousand years. The Roman Catholic church authorities, after the Spanish conquest, attempted to suppress the use of San Pedro. Based on the Christian influence in the past, the cactus became known as ‘San Pedro’ – the Saint Peter cactus. This name is attributed to the belief that just as St Peter holds the keys to heaven, the effects of the cactus allow those who use it to ‘reach heaven while still on earth’. The more traditional name for San Pedro is Huachuma. The San Pedro cactus contains a number of alkaloids, including mescaline. Mescaline is a psychedelic substance. 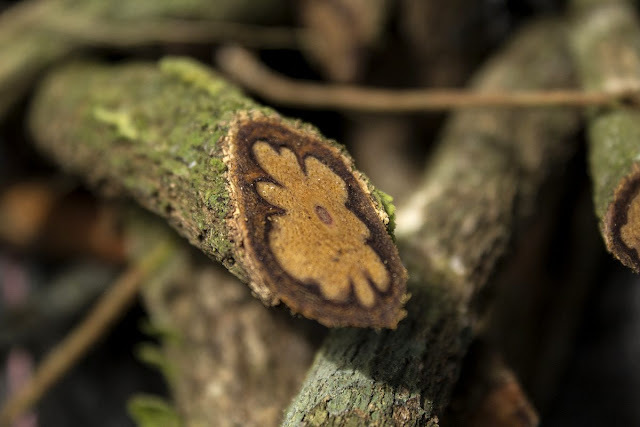 The Banisteriopsis caapi vine, mixed with the leaves of Chacruna or Chacropanga, is what makes up Ayahuasca (once the components are brewed together). While the vine is a key element, sometimes other plants are included in the recipe. Therefore the actual mixture of Ayahuasca can vary from place to place. Ayahusca does contain DMT, which is a psychedelic compound of the tryptamine family. Many indigenous Amazonian people say they received the instructions, on how to make Ayahuasca, directly from the spirits of the plants. Ayahuasca has been used for divinatory and healing purposes by the native peoples of Amazonian Peru, for a very long time now. Based on the wiki entry for Ayahuasca, some reports and scientific studies affirm that ritualized use of Ayahuasca may improve mental and physical health. Back in 2011, I was studying a Diploma in Energetic Healing part time, at the International College of Healing and Metaphysics in Sydney, Australia. While I was there, Sue from the Hummingbird Retreat Peru, did a talk at the College. The talk was based on the use of San Pedro, but also about an upcoming trip that started in Peru, which herself and Paul had planned — I went to that talk. Afterwards I didn’t do a lot of research on San Pedro, as I didn’t want any outside influence deterring me, or impacting my intuition, feeling and/or judgement, around the decision of partaking in the trip. The trip, including accommodation and food, was all planned out, and not only involved five San Pedro ceremonies, but also five traditional Q’ero Shaman hosted ceremonies, which were separate events to the plant medicine. All these ceremonies would take place at sacred sites throughout Peru and Bolivia, so it was also a sight seeing and spiritual type of journey. In the end, I listened to that inner voice and decided to commit and go. Note that some people can confuse San Pedro and/or Ayahuasca, as a drug. I have never taken drugs and I don’t ever plan to. I don’t at all view these as a drug — I view them as a form of plant based medicine. After my experiences, I still felt exactly the same about this, but what I feel (and think) has been reinforced from their use. 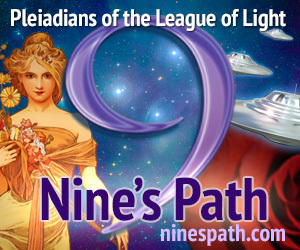 Also after their use, I knew they had a consciousness of their own, which was an important part of the healing and individual consciousness exploration process. Your intention, the space being held, the hosts supporting the process, and the energy of the land (location), are all key aspects of the use of plant based medicine. Below Paul’s video coming up next, I share with you what I wrote very soon after each session, back in 2011. There are four San Pedro sessions and one Ayahuasca session, of which I recorded my individual experiences. Experiencing Ayahuasca was a choice I made on my own, as it was not part of the guided trip organised by Sue and Paul. Paul has a short four minute video up on the Facebook page of the Hummingbird Retreat Peru, talking about the San Pedro cactus. I have embedded the video below as I think this explanation is very beneficial for understanding what it is, and what it can do (I highly recommend you take the time to watch this). It´s Saturday September the 10th, 2011, the day after my first ceremony with the plant medicine San Pedro. This ceremony was held by my hosts Suzanne and Paul at the Hummingbird Retreat Peru— http://hummingbirdretreatperu.com. I sit here on a computer with no internet access, inside a common area at Cecillia’s Bed and Breakfast (also known as La Casa Del Conde), in the village of Pisac. This village of around ten thousand in population — and also at ten thousand feet altitude — is in the Sacred Valley, north of Cusco, in Peru. High mud brick walls enclose the small Bed & Breakfast based structures, inside the enclosure. Lovely well maintained gardens and green lawns make up the rest of the space. There are only two people staying here including myself, but there are a number of workers here to tend the garden and one cook who is also a cleaner — she makes me breakfast every morning (she just did before) and tidies up my room every day. 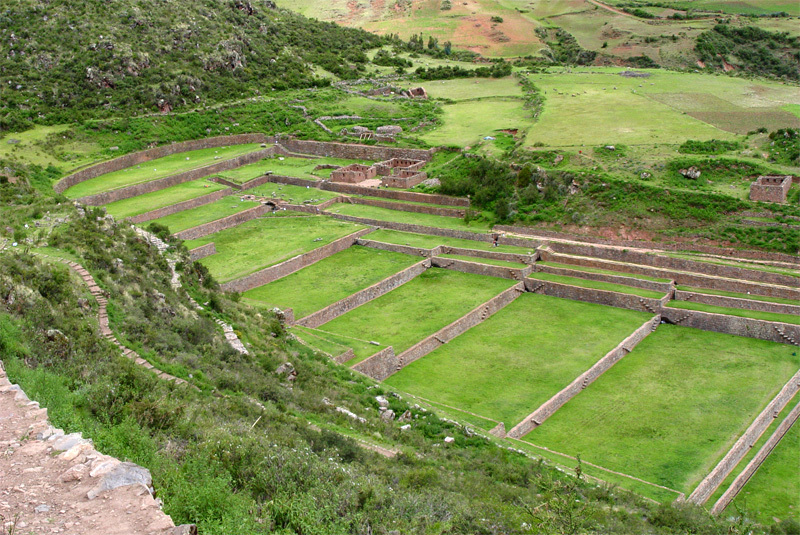 I am here for a week in Pisac, before I join the group in Cusco for our four week guided tour of Peru and Bolivia. I actually don’t think I’m fully back in my body right now, as I attempt to write this and recall the memories of the experience yesterday. Today is meant to be an integration day, which is a day of reflection on the experience of the ceremony. Since the effects of the San Pedro medicine wore of, I have been back in my head thinking far too much, which is actually the opposite of what the medicine did yesterday, as it can take you fully out of the mind, if you let go and allow it to — which I believe I must have done. What I experienced in this first session was very similar to what most people are trying to achieve with meditation, yoga, mantras, etc. Parts of what I experienced can’t be brought back with me, for me to explain to the reader, as our human mind is just not capable of computing or understanding all the information that I came upon, and which was shown to me. Basically, we are in this dimension as a human and we are limited somewhat because of that. As we move more fully into higher dimensions, we are not a human, we are in energy form — we don’t have a human mind. We also obtain a closer connection to our higher self. The plant for yesterdays ceremony was the cactus San Pedro, known as a heart based medicine and also very earthly — very grounding — in comparison to other medicine plants, such as Ayahuasca. Yesterday morning I was lead up the mountain by Paul. 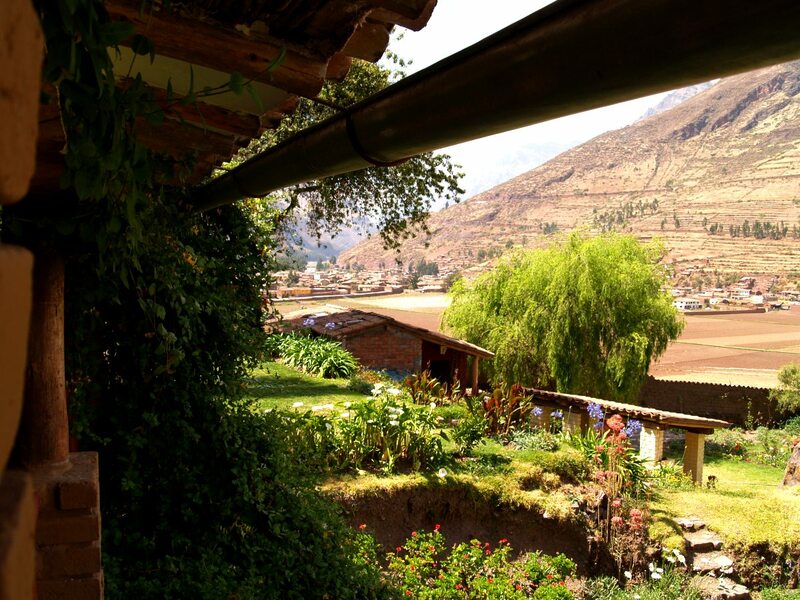 The location was behind the Hummingbird Retreat Peru, about a fifteen minute walk down the sacred valley from the Bed & Breakfast I am staying at. We went up to a grassy area next to some stone ruins. Paul went through a ritual to begin the ceremony. This involved carefully putting together a medicine wheel on the ground, as well as other preparations, including smudging. Once all that was completed, and we were settled and tuned into the moment, we proceeded to drink a cup of the cactus juice. It was about 9:30AM when we began. The taste was not that nice but not too bad, as I have drank a few nasty things over the years, such as the master cleanse lemonade detox concoction many times. It did taste like what you would expect a cactus brew would taste like. It was sort of like a bitter thick shake, with the texture of the inside of a tomato and/or passion fruit, but without the seeds. It was a bit slimy as well, with strands of the stuff sometimes getting caught on your lips, and chin, as you swallowed. During the days leading up to this moment, I had given myself some time to think on what intentions I would bring into the first session. Of course, I had also done this before making the long journey by plane from Australia, but it was important to go over this once again. I came into the country with a list of primary intentions, but not enough for all of the ceremonies I would partake in, as I had decided to do a few extra ones. I feel the need to repeat this again —it is very important to approach these ceremonies with clear intentions of what you want to get out of them. Your intentions could relate to healing (which is a broad area), consciousness development and exploration(one in the seem, really), or possibly a metaphysical related wish or desire. But it’s important to be aware that after you have one of these experiences, your life may go in a completely different direction depending on the state of your consciousness before going in, so it’s alright to change your mind about intentions as you go along. You may want to know what your life’s purpose is. You may want to understand a concept which the answer may have eluded you, up until that point in life. You may have cancer or another illness which you want to focus on, heal, and/or get answers around. You may simply be lost in life and need some form of guidance and/or direction. These are some of the many intentions you could bring in. About an hour had passed now. I had been sitting down the whole time. I was looking out over the valley when we both decided I needed another half a cup, as I was not experiencing anything by that stage — which was a little bit unusual (I had consumed a full cup when we began). Shortly after, I started to feel very ill. It came in waves. At one stage I was wondering if I was going to throw up. Throughout the morning this sick feeling stayed with me, but once I reached the peak of the medicine, it went away. Roughly two hours had now passed since we began and it all started for me. It came on gradually at first. I started seeing white specks with my eyes open. It was like some kind of energy was appearing up there in the sky. With my eyes closed, I started seeing strong colours, which I had never seen in this way before. It started with red and moved onto pink and then other colours. Just to put things into perspective, the whole experience lasted about twelve hours or so, and time just did not function as it usually would. This was the case over most of that twelve hour period. So twelve hours is not really long at all because of the dimensional time influence-thing going on while the cactus brew did its healing and took me on a journey with its unique conscious process (it has a life of its own!). With my eyes closed, I started seeing images — other places away from Earth. I could not focus on any one thing, as the images kept changing very fast. I was guided beforehand and instructed not to analyse or think too much based on what I had occur — I remembered this and did my best to let go and release my self into the flow of what was being perceived. I saw many interesting and strange things, things that I did not understand. There was sometimes human like faces, forms of energy, alien faces, locations on other planets (which had life), and so much more. From time to time I would open my eyes, stand up and walk around. This was like a break for me; it was a small time out while the process continued on, but I was just more aware of being back in my body when I did that. I felt, and knew, it continued on, and I didn’t feel I was interrupting it at all when I got up or opened my eyes. I was always fully in control of when I wanted to open my eyes or perform an action in relation to my physical body. It was not until much later on into the ceremony that I actually started seeing things with my eyes open. This I found very cool, but a bit weird at the same time. After being shown all these things that did not make too much sense, my intention that I brought into this ceremony suddenly came into play. I was shown information on how to open up my heart, and how to assist with unblocking the chakra. It was very easily explained to me with a knowing (instant understanding in a way), but also with images. I was slowly getting to the stage of not being connected to my mind at that point. This is a very hard thing to explain, but once the peak of the medicine was there, I was no longer in my head or in my body at all. It was like my consciousness had moved (fully), somewhere else, and there was no ego there any more. There was no attachment to the ego system that accompanied my human form — the ego which I knew very well, as I had done a lot of work with overcoming and controlling it by that stage in my life (mainly thanks to gnostic based teachings). There was also no attachment to anything back on Earth, for a number of hours during that period. I felt very different, and this is where it becomes impossible to explain fully what I felt, as this is not something that can be explained properly and fully — only through direct experience can you understand this. This out of mind-body-ego sensation only got stronger as the day went on. In the meantime I could still open my eyes and function, but it was a real effort to do things, as thinking was not really part of where I was now, at that stage. It would probably have been early or late afternoon by then, as it got cold and I grabbed my hoody. At the time we had lunch and drank some tea. But I was not really there. Within my mind, I asked questions about things I wanted to know and I was shown answers. I had the knowing I was connected to my higher self at this stage and while I was asking questions, I was also answering them for myself, which was hard to comprehend and is very hard to explain in words. There were a lot of things going on then and it was happening very fast, in a complex way, as I was fully up there and connected. I was connected to spirit basically — and to my higher self. One answer to a question I will mention, that is really important to talk about I believe, is that I was shown how small each of us are in comparison to the greater scheme of things. This one spirit we have here — and the higher self that controls multiple — is one of so many out there. I was shown this in a moving based vision, and it was a knowing as well. I can not explain this very well. Right now I analyse it and the only answer I have is that there are multiple realities out there which, on a higher level, are accessed by spirit/higher selves in the process of learning and growing for the soul. As those on the path know, souls in the Earth School have many lives so that the higher self can experience teachings and learnings, to grow and develop spiritually and to eventually ascend or move onto a higher form of existence (while becoming closer to source). I felt truly humbled right in that instant of being shown this. I can’t express how powerful this feeling of humbleness was. I knew it was the maximum amount I could ever feel, in regards to feeling humble, based on what occurred for me. I came out of the experience later on, thinking how very unimportant things are that we worry about, have to make choices on, argue over, etc. Existence is so much larger, so much grander, than this little place here — so much more than what we experience with our day-to-day human lives. I guess the biggest impact of this first ceremony was having the experience of loosing the mind and ego attachment, while being so fully open, after letting go. Existing in a higher form, in a higher dimension, is not something that can be explained here very easily so that another can fully understand my experience. After all, this is an individual journey and each person needs to go down their own path, to find their own answers, with direct experience. After all of that, I got to the stage where I opened my eyes and I could see this green energy around things, such as the trees, the land and the mountains. I could also see movement with what I was looking at, as when I focused my vision on the side of a mountain I could see it was kind of moving. When I looked up at the blue sky, I could see letters forming, but nothing was comprehensible based on those letters. I did feel the land was alive. The mountain had a consciousness within — somehow. I believe that I needed to read, learn and directly experience many different aspects of spirituality and metaphysics before coming into this ceremony. Otherwise I would not have understood and/or been shown what I was. I doubt if I had done this ten years earlier, that I would have had such an important and amazing experience. My passion for astral projection heavily related to some of the things I experienced here, but there’s many other metaphysical areas I was familiar with in addition to that. I wasn’t really surprised by anything. I did have a good understanding of what I was shown in this particular session. The day after my first ceremony, which I now feel was more powerful than my second, I was still recovering and I was clearly not back to my normal human third dimensional based self. I had a bit of fear at this stage about doing another ceremony. But over the next few days I realised I wanted to continue on this healing journey, and that I was ready for the second one by the time it came around. What was causing the fear? I think it was simply the fact that I lost a lot of control and was taken out of my physical body to another vibrational level. But this is not unusual and is what sometimes occurs during these plant medicine based experiences. I did explain the experience of my first ceremony to Sue. She is originally from Australia and is a very experienced shaman based energy healer, in addition to her years of experience with hosting San Pedro ceremonies. She said that she thought the cactus was showing me its full potential within the first ceremony. It was a full moon when the day came along for my second San Pedro ceremony. My first ceremony was on a Friday and the second was on a Monday, so I had two full days to integrate the incredible experience of the first ceremony. The location this time was at the Hummingbird Retreat Peru, the home of my two hosts Sue and Paul. It was about 9 AM when we all gathered under a grey grass roof, inside a maloca which was ringed by a short stone wall at the bottom of the garden. There was Sue, Paul, a male and female couple from South Africa around my age (they had lived here for over a year) and an older female who was a meditation teacher from Sydney — I had got to know her over the previous two days. This was the 80th ceremony for the couple from South Africa. The Maloca I sat in at the Hummingbird Retreat Peru, in Pisac. Paul began the process as we sat there in a circle. I learnt a bit more about him this day and his long term experience with using San Pedro and Ayahuasca. I found out that he had experienced over 300 sessions with San Pedro (at that point in 2011). While he didn’t use the title of ‘Shaman’ he had a vast amount of experience with hosting and providing a space for those wishing to undergo the ceremonies. We sat on our meditation mats as Paul went through a few shamanistic traditional based processes, such as placing coca leaves around the area, cleansing our bodies with smoke while we put our intentions into what we wanted to get out of the experience that day. I was chosen to drink first out of the six of us. At this stage I was starting to dislike the look of the cactus brew. It is said that the first time is easy, but every time after gets that little bit harder because the taste does not grow on you. At the time, I of course didn’t really believe I could grow to dislike it, as it was easy to get down the first time. From where I was sitting, I could tell that this particular brew looked much more chunky than the one I drank in the first ceremony. It reminded us all of mucus, basically. The look on some of the faces of the people in the circle who had done this so many times before, was slightly comical, as they knew what it was like after multiple ceremonies. I really had no idea. The day before, I had helped prepare this brew I was about to drink. It is a long process. We first peeled the cactus — which takes forever — then there was a technique of cutting the exact amount off the edges of it. Then cutting more off on different angles. Once that was done, we chopped it all up into small pieces. From there, it would be boiled for a number of hours, with lots of stirring involved. Finally, it would then be strained a few times, before it would be left to sit. 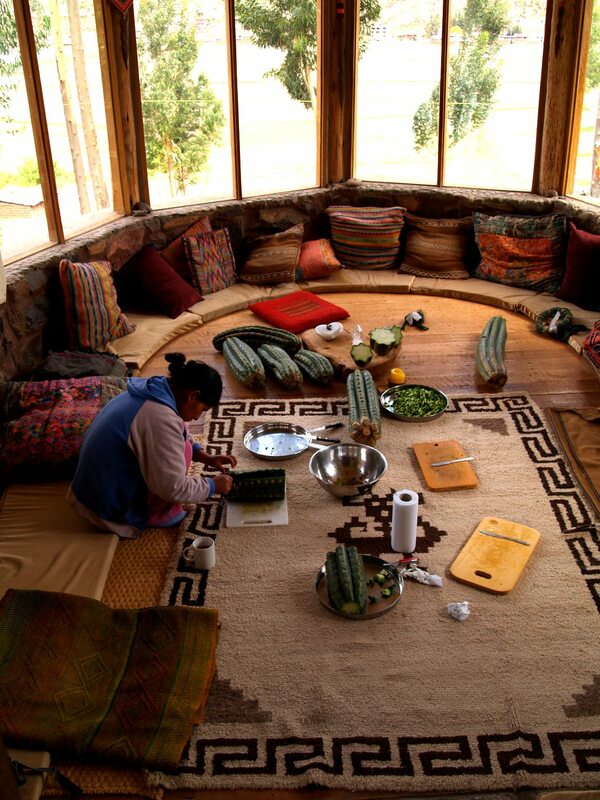 During that whole process we had the opportunity to put our intentions into the energy of the cactus, during the preparation of it, as it formed into a liquid. Preparing the cactus is actually rather complex. Not only is the cutting of the cactus important, but also how long you simmer it for, how much froth you take off the top, etc. The actual cactus can be a male or female and have a certain amount of edges around it. So a twelve edged cactus is known to be of a higher vibration. Where say a six edged one is a lower vibration and can be known to be a bit stronger, in comparison to a twelve. With my first San Pedro ceremony, I luckily had the chance to use a 12 edged San Pedro brew, which Paul had saved for his birthday. I believe this really did make a difference, as with the proceeding sessions, I never had an experience that closely matched the first one. So there I was, going first — I started to drink it. I realised that this tasted pretty bad in comparison to the first one. I had to really concentrate as the thick stuff went down my throat. I actually felt for a second that I was going to throw up! But that moment was quickly overcome. I got it down in the end, with long bits of cactus (mucus!) dripping out of my mouth. After everyone else had their turn, we headed into the upper area of the garden where there were grass lawns and flat areas to sit or lie down on. 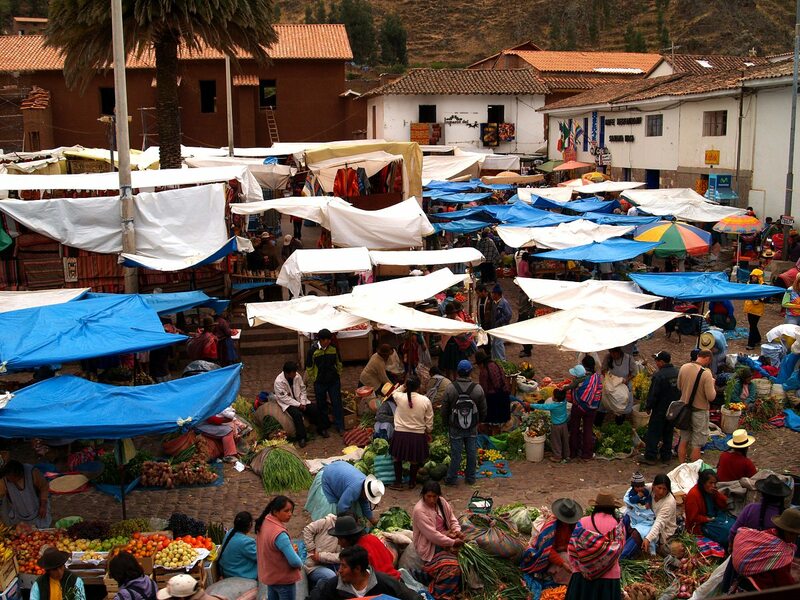 I had purchased a very nice green patterned thick rug the day before at the Sunday Pisac markets. I got this rug specifically for this purpose, which I had under me on the grass (I call it a rug because it was so heavy to cart around with me over Peru and Bolivia). A few people went inside. Over the span of the day, people moved between the house and the lawn as the ceremony went on. A photo I took of the Pisac Markets in Peru. This one was strong — it wasn’t long before it went to my head. I had a heavy energetic sensation going on up there. I don’t remember this time if I got very sick. One of my intentions related to clearing any energy blocks within my base chakra. I had been told by more than one intuitive in the past, that there was a big issue there. But, I was open for the cactus to go where it wanted and needed to, this day. I had a few secondary intentions but I felt they were not as important as the one I had set forth, in relation to my base chakra. After about an hour I felt the San Pedro having a stronger effect within me. I would say that possibly two and a half hours or so went by until it was really doing its work in full (three to four hours until it peaked). Just like the previous ceremony, I only saw something different to the norm when I closed my eyes. So I had my eyes closed between breaks, and I was being shown many unusual, random and sometimes crazy images and scenes in my mind. I was feeling that I was not as highly connected as last time, and that this was more of an internal and mental based healing session. I was trying to figure out in my head what I was seeing actually meant, but I couldn’t. It was greatly frustrating me as I was hoping for more of a clearer experience, something I could grasp and understand – but it was the opposite — I was not meant to understand this. I have been told so many times to let go of the mind, stop thinking and just let it do its thing. But for some reason, this was constantly pulling me inside my mind and making me feel like I had no control over what I was seeing, and I really did start to get the feeling of being crazy, as I kept being presented with many images with my eyes closed. Of course, I didn’t really think it was possible I could be ‘crazy’ (‘Laron isn’t crazy!’), so I had a bit of denial going on (maybe a lot). Eventually I was shown that this was the purpose of what was happening to me (I had a knowing as well). I then understood that I needed to let go of worrying about what other people thought of me, that it was OK to look crazy sometimes, and it didn’t matter if people thought I was ‘crazy’. It was related to my heart chakra, and it was teaching me that I should stop thinking and worrying about how other people view me. It is said that it is really OK to not understand what goes on, and that the cactus will heal and work on whatever it is working on (you have to trust!). But I like to understand things, that is my nature, so that day was a real challenge. While all this was going on throughout the day, we all had breaks occasionally. I drank ginger tea (I really loved that tea) and purple corn drinks (an acquired taste). I did not throw up during the session, but for most people, it can be common to purge, as that is just part of the healing process. I started to notice letters in the sky again, and strange colours around things. So when opening my eyes, this was going on. Time was again very different. It’s hard to explain, but time was slower, but also faster — both at the same time. I was definitely connected into a higher dimension again, but not as high as I was in the first ceremony. I didn’t feel as far away from my body. From time to time, Paul or Sue would come by and check in on me, asking me a few things, making sure I was OK and helping me release energy blocks. I think that at one stage, Sue really helped clear an issue related to my base chakra, which was about my intention, as I finally saw an image that made sense to me that related. About 2:30PM, six or so hours after we started, I knew it was mostly over, as I was gaining more control of my body and my mind. I also had a knowing that I was ‘out’ — as in, I was no longer up and connected like I had been earlier (I felt confident about this). Over the next thirty minutes to an hour, I was thinking pretty clearly again and moving around the garden and inside the house. Nothing appeared after that, when I closed my eyes — it was all blank. But, I still noticed the things in the sky and weird colours around stuff when my eyes were open. This was unusual, coming out of it so quick, as San Pedro usually lasts up to 12 hours. I learnt that this was a very powerful brew and the other people in the group were having a challenging time up until late in the night. The older lady from Sydney was still very connected in, after I left at about 9PM. It was a huge healing for her, even after the evening set in, I held the space next to her, now and again, in the lounge area inside. Throughout my journey, I found that while there was a lot of work going on for me, I also brought in my own energy and healing influence that assisted others, likely unknown to them, during the five or so weeks I was there. During the rest of the time, I did some meditation and had some energy work done on me by Sue, as it got dark. I got clearer and clearer after that. I felt very centered during these clearer times. It was like being in a state of meditation, but without having to meditate. I trusted that what was needed to be done was done by then, as I really was thrown out of the whole process very early. In comparison to the first ceremony, where I was still well under and connected up until say 8PM, it didn’t feel as strong for me. My understanding around this at the time, was that I was functioning on a higher vibration (level) because of my astral projection work, in combination with other consciousness based development I had heavily been involved with, in the years leading up to the trip. While I was able to connect more easily with the higher vibrational brew in the first ceremony, I knew that I needed to have a lot of work done on the lower levels, such as what happened in this ceremony, as I needed to function as a human in this life and unblock all the blocks and issues that are there for me, so that I can do what I do… better, but also so that I know how all this works to be able to help others. There is nothing like direct experience if you are a teacher, no matter what the subject matter is. Today is the day after my second ceremony, as I write this up in the evening. All day I have been pretty clear. Where the day after my first ceremony, I needed a lot of rest and my mind was kind of in overdrive. The material for this third San Pedro experience is based upon hand written notes. Eleven of us headed up to the Inca ruins of Tipón, 27km’s south-east of Cusco. We filled three taxis and ended up having a bit of trouble reaching our destination. The staff at the hotel we were staying at told the taxi drivers to use a back road, which was similar to a dairy / stock farmers raceway. The taxis reached a point where there was a huge ditch crossing over the road, blocking access completely so that we could not continue on. Each taxi driver had to perform a miracle turn, so we could head back and find another route. Tipón had agricultural terraces, a lot like other places we had seen around Peru, but this was a bit different as it was all laid out with water running down the centre. When you stood at the source of the spring, you could see the valley below. When I did that during the ceremony, when I was flying still, I felt that what I saw ahead of me came out of a females body. That was my perception based on picking up on the energy of the past, which was still very strong there. The design of the waterways, channels, and terraces, were like a birth had taken place — one that created everything below the site. We found a spot, away from the public pathways, and got set-up. I had a moonstone crystal on my ceremony rug, and I also brought along a rose quartz crystal that I had picked up very cheaply at a market in Pisac. Each of us took turns drinking. I had a cup and then when everyone was done, I had another half a cup, as I wanted to experiment and make sure I had a strong enough reaction this time around — based on how I had gone in the first two sessions. I came close to gagging while trying to get it down. It really was becoming a challenge for me by that stage, to swallow it. After that extra half a cup, I headed back to my rug and waited. This one was a slow one to come on, and very gentle. Eventually, I started seeing a few things, but not much, and nothing which I would consider important. My intention for the day was related to past relationships. I had the ill feeling inside, which came and went… and came and went, but eventually left me after a few hours had passed. This was a very physical experience for me. I felt many sensations within my body. I felt the energy moving around, much more so than what I had experienced in the first two ceremonies. I was shaking at times, throughout different parts of my body, because of how strong the energy activity was. At various stages, Sue or Paul would come and check up on me and help with the healing process — I sometimes used these opportunities to slip back into a clearer mind. I also think this helped the medicine do its work more effectively. I could feel the energy in my body changing when they worked on me. A few times during this session, they would stick a hand over my heart chakra. With this ceremony, I once again felt I was not fully out of my body — such as what I had occur with the first San Pedro experience, but I was fully up there when it peaked that day (hence my term of flying earlier). I don’t remember anything much that happened when my eyes were closed, but in the afternoon I had some knowings and insights about the people in my group. A few of these knowings would serve me later once I returned back to my life in Sydney. One of these knowings that came to me related to how I was a shaman, similar to Sue and Paul, but I was also shown I was so much more — yet I had no idea what more I could be, in those moments. I was guessing it would be relating to my future work with astral projection, but I did also see myself learning what Sue and Paul do and hosting my own ceremonies in the future. 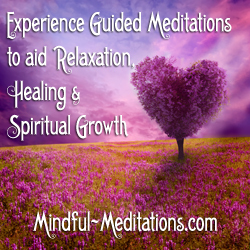 While this time, because of the lack of visual images with my eyes closed, I wasn’t really sure what was going on with the healing aspects of the experience that day. I did know it was a day of connecting strongly with the land and the sky. I could feel the energy of the earth — I knew this was important for me. A few crystals I picked up in Peru, including the rose quartz (top left) mentioned above. From about midday I felt I didn’t need to close my eyes any more. I had the feeling to look around me and connect more with nature, which is what I pretty much did the rest of the day until I came down. Later on in the day, our group moved from where we were sitting and hanging around, to another part of the ruins. We walked to the source of the springs where the water came out of the mountain and traversed down into the irrigation system, around the terraces. I stood at various places where there were small water falls and felt the energy coming strait out at me, right where the water came out of the underground openings. It was like a force of energy pushing into me. I came out of it that day feeling more connected to my own individual power. I felt that I was meant to do something very important in the future — or at least a number of important things. I was shown, and had the knowing, that the relationship issues which I had gone through in the past made me much stronger, not only my souls growth, but the mental state of the person I was at that point in time. I also knew that those painful situations which I can experienced were very small things, in the greater scheme of my life, and not so important compared to who I was and what I would be doing in the future. I again did not purge (throw up), but I had a feeling I would next time. I also had this feeling near the end of the ceremony, that my life was not so much about settling down and making a family, but coming into my power as an individual. As I wrote down these notes, I knew that I was changing on a deeper level — like actually having a lot of change happening on a consciousness and physiological level. It was still early days though. Eleven of us jumped into three taxis outside the cottages where we were staying near Cusco, and headed off to another ancient site which was about a thirty minute drive away. Once we got there, we walked for about fifteen minutes. The site was Inca based again, and was a place where a military conflict had once occurred — some of the people in our group sensed that the Spanish invasion had ties to the conflict here. A few of our group also sensed spirits around the area. We started our ceremony and I had one cup, and again after waiting for everyone to have theirs, I decided to half another half a cup. This was pretty hard for me to get down as well. I found that every time I drank, it just got harder and harder to get all of it down. Some of the female members of the group had half a cup, everyone else just had the one cup. The night before this San Pedro experience, I had picked a tarot card (not the typical set though). This had become a standard ritual that most of us would perform, before coming into a San Pedro Ceremony. The card which came up for this ceremony was ‘The Higher Self’ — the same card I got for my first ceremony. After the process that started the session, I then moved out of the circle and situated myself next to a single, rather tall, crumbling stone wall. I noticed that this time around I was starting to feel very sick down there and I knew a purge was likely to come. I was fighting it, but about an hour in I had to get up and do something about it. I went behind that wall. It had taken four ceremonies for me to finally purge. I knew it was coming and was going to happen eventually (I had this strong knowing around that beforehand). When purging, I saw images in my mind — with my eyes closed — and I felt the energy being released. You can think of this as releasing any energy that has built up, which does not belong within your energy field and is not for your higher good. So that energy could be tied into energetic blocks, which can cause us to get sick. It could relate to an energetic attachment, which was created and manifested through focusing on an egoic element too strongly from thoughts and actions in life. It could relate to an energetic connection with regards to a past romantic relationship. It can be from a number of situations. It’s important to understand that it’s a good thing when you purge, and it’s a natural process to go through when dealing with plant based medicine. 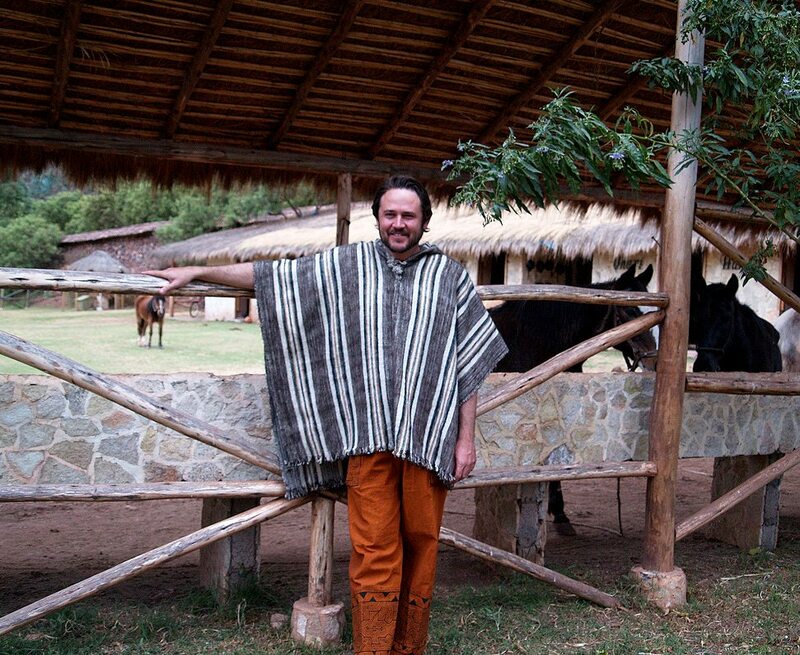 A photo of me wearing Ayahuasca trousers and a wool poncho — standing opposite to the ‘cottage’ mentioned above. After that, I went to lay back down. I felt this was another strong experience. Later in the day I realised it was the strongest so far, but still very different in comparison to the first three ceremonies. I had a lot of visual experiences with my eyes closed, not so much with them open. I also felt that I had more of a loss of control of my body. Time was very different once again and I had to do things very slowly, if I was up and about. My intention for this ceremony was relationships once more. Sue checked in with me early on. This was around the time I started having understandings, through images, around what went on during my childhood and how that connected into situations throughout my life. I was shown something that I had expected, something that happened to me when I was very young. 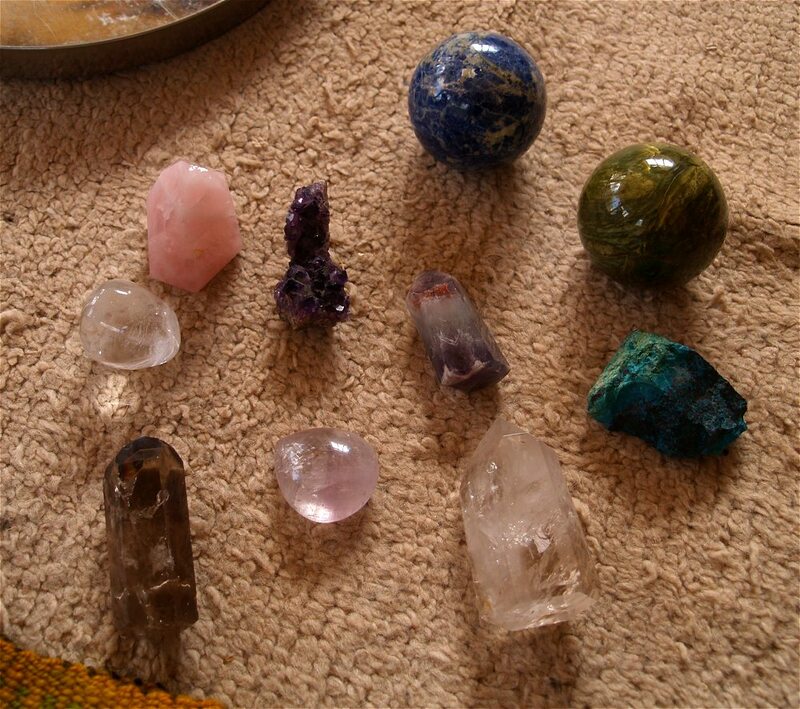 This was a major release for me, related to the base chakra. I did feel that this did help to clear the chakra. Later on, Paul came along and guided me through a chakra opening meditation. I had images in my mind of each one opening and snakes going up around my spine and up my back. I felt my kundalini was rising in those moments. 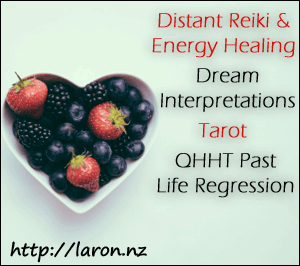 I felt this was a major healing day for me, that something amazing went on and was a key component to my future psychic development and progress, including my spiritual development. In the early afternoon I walked around a bit, as I felt that what needed to be done, was again done, so it was time to enjoy the site, and become more familiar with the old ruins. At one point, I stood up high on a bank overlooking the area and I sensed the scale of the place, before it was destroyed (there wasn’t much left of it). It was huge. I understood it was some kind of military fortification and that where I had been sitting was some kind of hall. I felt this day was again an amazing experience for me. I was doing so much better at not thinking and analysing each thing I experienced during the process, compared to previous ceremonies. Other people were also having a huge day. Fear — I wasn’t expecting to run into it with my plant medicine ceremonies, but I did, especially in a greater way with Ayahuasca. This guided trip didn’t include an Ayahuasca ceremony, but since I was in Peru, I wanted to experience it. I had come to understand how important the land was. The energetics of Peru and Bolivia were amazing (there goes that word again), and I couldn’t pass up an opportunity to try Ayahuasca, as I wasn’t sure if I would ever be back again. Paul arranged the ceremony for me with his friend Miguel, who he had known for over 30 years. Miguel was an experienced Ayahuasca host. Paul and Miguel had both learnt under the same maestro. This maestro lived in the jungle near the Amazon, and was a native to the land. He was one of only a small handful of people left in the world who still performed the traditional shamanistic based healing techniques. Miguel and Paul were two of only six westerners, who had studied under this maestro, and learnt to host Ayahuasca ceremonies. There had been about six from the group I was traveling with over the previous four weeks or so, who were going to try Ayahuasca with me. But in the end, they all changed their minds and I was left to do it alone. However, one of them did decide to come along with me to provide me some support at the last minute, since it was my first time, and since he had previous experience with using Ayahuasca in Chile. I have to admit, this decision to try an Ayahuasca ceremony took a lot of courage. I was someone who had never been on a roller coaster, sky dived or even bungee jumped, and yes, one could say that Ayahuasca could be compared to such things. 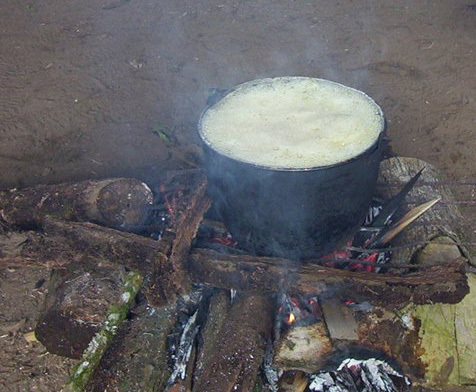 Ayahuasca is a very different experience to San Pedro. I didn’t know a whole lot about it, as per my intentions around wanting to go with my intuition at the time. I had heard a few things from some of the people in my group, over the time I had been with them, and some things didn’t exactly make me feel better about deciding to try it. I knew it was more powerful than the cactus San Pedro, but not in a negative way, just in a more masculine and cosmic way. Where San Pedro takes you within and keeps you grounded with the energy of the earth and the heart, Ayahuasca takes you out into the cosmos — and that’s exactly what happened to me. The Ayahuasca ceremony took place inside a straw roofed enclosure, with glass windows and wood walls. From what I understand, these types of structures are usually open on the sides and just have a roof, but this one was a bit different (I believe this was also a maloca). Inside I was with a male travelling companion from Australia, our host Miguel, his apprentice from Germany, and a girl from Hawaii who had been doing Ayahuasca for over a year. We sat in a circle with a candle going, after turning the lights off. It was around seven at night. We got to know each other a bit. The apprentice came around to each of us, singing a non-English based song, and wiping this strange stuff from a bottle onto us, which was meant to be for protection. We then each took a turn drinking. The liquid was very thick. The amount we had was probably about 100ml. It tasted very interesting — a little bit sweet, but also very bad. Since it was my first time, I didn’t mind it and swallowed it. But as I hear, it gets harder and harder to swallow the more you take it (I knew what that was like). I understood that Ayahuasca came on faster than San Pedro, and it did for me. I felt like laying down about fifteen minutes later. Then perhaps thirty minutes in, I was feeling it coming on. Around forty five minutes to and hour in, it started coming on strongly. I don´t remember everything. It really was a very different experience to what I had with the cactus. I first remember geometric shapes with my eyes closed — colours and shapes. At that time, it was pitch black outside, as Ayahuasca ceremonies are meant to be performed at night. I could see the stars through a few windows up in the roof. After a while, the two hosts started singing songs. They would take turns. These songs were in an Indian based language. They were beautiful. They ended up being like a hand rail for me. My body was really feeling it at this stage. I didn’t get sick early on, like with some of the San Pedro sessions. I didn’t actually purge until after the ceremony, when people went to sleep, but everyone else was throwing up in their buckets every so often, frequently — which is quite normal for Ayahuasca. I felt a lot of pressure against my skin, as it came on stronger, with its waves coming and going. I felt myself being dragged, or pulled, up into other dimensions, into the cosmos, and I was scared. I knew that I had to let go, that it was OK. I was shown how connected we all are — our energy and consciousness — and how we all are part of the same source. I was being pulled into that consciousness in one of the waves that hit me. I didn’t want to lose my individuality. My sense of self, as I felt that if I let go, I would join into this pool. I kept opening my eyes to stop the process, which helped somewhat, but I also kept shutting them as I knew I had to keep trying and trying to get past this control issue I had, and overcome that fear. While this was going on, Miguel sang, and I would use the songs to ground myself. I used that music as something to keep attached to and to guide me. It was really amazing (I know, I keep repeating this word), the experience at this stage, with this singing going on (there was no instrument) and what I was experiencing. I had so much more going on which I have forgotten — I remember being in a bed of snakes. Having these white, and other coloured snakes, moving around my body. One of the snakes was a giant snake, pure white. The visions were much more distinct, in comparison to the San Pedro ceremonies. This whole session with the Ayahuasca had more of an impact on me, in terms of the visual and physical experience, but also the mental and psychological impact. When these snakes were doing their thing, I had a knowing that it was related to a healing process. Before starting, we were asked how much we wanted to drink. Miguel called the full cup the way of the warrior. And at that stage, I thought that was a bit silly. But as the night progressed, I know why it had that metaphor. You are a warrior when you do this. You have to be very brave to jump into this plant medicine — and you have to be ready. I have to explain the waves — you kind of have a high, then you come down again and wait for the next wave consisting of experiences and visions. This is what went on for two to three hours for me. Usually Ayahuasca lasts around 5 hours, much shorter than the 12-14 hour San Pedro experience. I remember that I wanted out when I had the fear in the first group of waves. I wanted it to end. I didn’t expect to feel like that. I remember opening my eyes to try and stop it, but what I was seeing with my eyes open, was just as strange — in the light of the moonlight, my arms were strange colours and somewhat transparent. I had a kind of blurred vision and I knew that I had to let go and just accept it (I didn’t have a choice). The fear subsided after those initial waves, and my experience changed to many other things after that. It´s a bit annoying that I can’t remember much else. But possibly, a third of the ceremony was a challenge, with the fear and the need to want to control, and not let go. Where the rest of it was beautiful. So it was bad, but then it was good. Sometimes you have to experience the dark, before you can experience the light. Fear is simply part of the process of development with the human experience. To move beyond fear, you first have to experience it. One of my intentions was to fix an old back injury. I had visions of this part of my body being healed. What I saw was shapes moving into place on my back, and my impression was like armour being put onto my back, in layers. So much more went on, and the songs were so magical and grounding along the way. The Hawaiian girl sang from time to time, as well, and she had the most mesmerising voice because of the influence of Ayahuasca. I was waiting to purge the whole night, and it never came until it was over. At one stage I was very connected in and just before Miguel come to sing to me directly, the Hawaiian girl started to sing from across the room. I felt that she was singing in connection to me (a knowing I had). Miguel then started his song. After he finished, he had to reach for my bucket to spit into it and I then heard the Hawaiian girl purge. I had this knowing that she had somehow grabbed something from me and was purging for me, and so had the shaman. This is just one of the things you can sometimes sense in these ceremonies, when you are so connected into the energies. I would love to write about the places I visited, things I saw, beings I met — but I just don’t remember. After three to four hours, the songs turned into English spoken stories. They were very deep type stories with humour chucked in. Sometimes there were a few short jokes. This worked perfectly and it brought us back into the space, as we came down. Eventually a candle was lit and we talked a bit longer. We had started around seven thirty — it was about midnight at this stage. Another hour or two went by, then the candle was blown out and we went to sleep. Well, I tried to go to sleep on the thin mattresses that I was provided with. About thirty minutes after the candle was blown out, I had to purge. The Ayahuasca experience reminded me somewhat of my first San Pedro ceremony, where I was less attached to my physical bodies consciousness — back on Earth. I had the sense and was reminded again, during this Ayahuasca ceremony, of how small we are, and also how unimportant most of the things we do in life are. I came to understand why it can be hard for some people to integrate back into society, once they return back from these sessions with the plant medicine. As I write this conclusion now, in June 2015, which is just over three and a half years since the plant medicine experiences discussed above, I look back and see the many changes which have taken place in my life. These changes have been practical, they have been psychological, but also spiritual. While we all come from different walks of life, and some of us come from locations beyond the Earth school (volunteer souls), I know that age plays an important factor in regard to the trigger of major changes, at different points of time, within a humans life on earth; astrology ties directly into these times of increased change, and is a foundation beneath them, as per life’s planning before arriving — astrology can be used to grasp how age relates and fits in. I have had validations around the many changes felt within — spiritually & consciously speaking — those that know me well have seen these changes. I feel that going into detail and explaining them may just be a distraction from what is really important with regards to what I have shared here. The greater message is not at all about me, it’s about you. It’s about your own individual journey towards, what some may call, enlightenment. As I expressed at the beginning of this article, I highly recommend you consider San Pedro as an option towards whatever your intentions may be. If you are ready for a sudden jump into your consciousness, with both understanding it, and your nature, more fully, in addition to finding a few answers around your intentions, and resolving a number of long term issues which could be holding you back — then this is an effective method to explore. Ayahuasca is very different to San Pedro. If I was asked which of the two I would recommend, with my limited experience on their use, I would say, ‘well, it depends on your intentions, but also certain factors relating to your psychological makeup,’ to put it bluntly. I see San Pedro as a place to start the journey, and Ayahuasca as an option to further expand on what it is you may want to do, if your intentions are appropriate, and if you are ready for it. 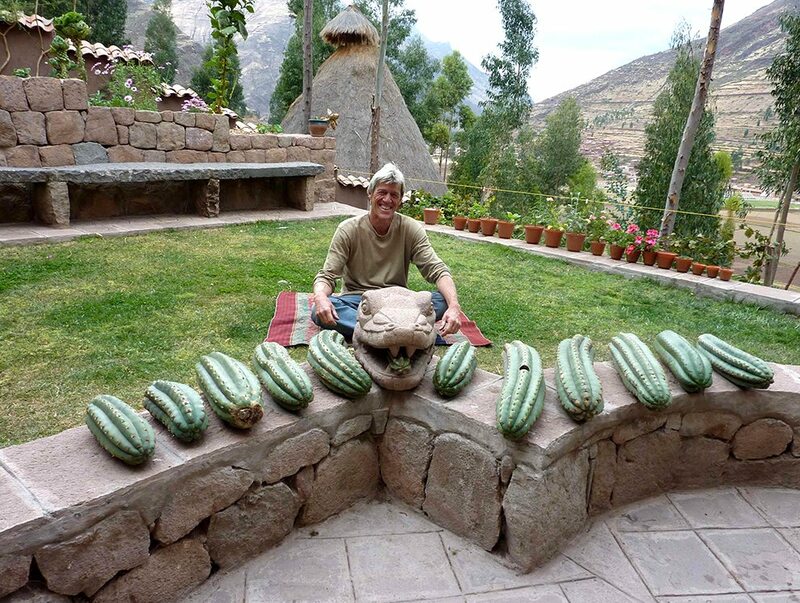 Paul sitting with twelve San Pedro cactus’s at the Hummingbird Retreat Peru, in Pisac. 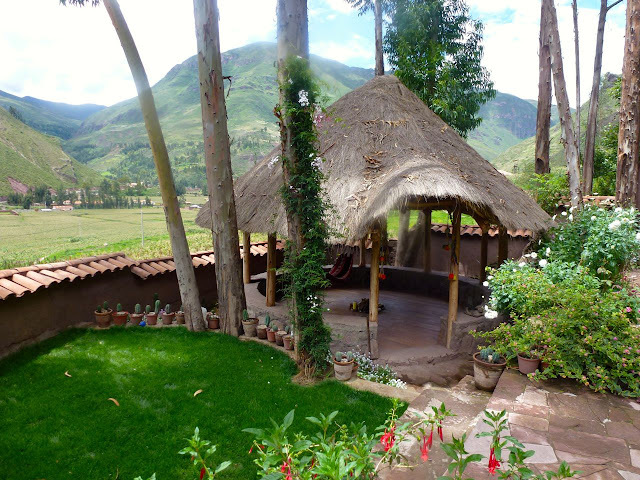 I wanted to conclude with some information about the Hummingbird Retreat Peru, which is run by Paul Temple and Suzanne Lewarne. 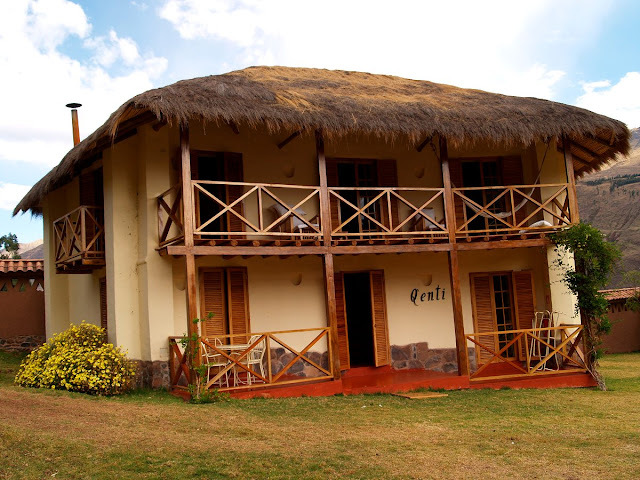 The retreat offers accommodation, San Pedro ceremonies, healing services, and sustainable tours tailor made to your needs. You can find more information over on their website here, http://hummingbirdretreatperu.com. Their Facebook Page can also be found here. This work is licensed under a Creative Commons Attribution-NonCommercial-NoDerivs. You’re allowed to share this article for non commercial purposes, but you must not edit or modify the contents and you must give appropriate credit. You must also include this licence information, if shared in full.